The old fashioned sweet potato pie recipes are very easy to make, and the homemade pies are delicious with an authentic Southern taste. I guarantee you'll want seconds, so you better bake two! Simply choose whatever style of pie that appeals to you. Some enjoy their sweet potato pies with a flaky top crust, others prefer the melt-in-your-mouth meringue version, while still others prefer an old-style open pie. It's your choice. All are delicious! Enjoy a tasty dessert from the Old South. 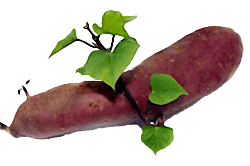 Boil tender two large or four medium sweet potatoes, peel, free of strings, and mash fine. Add to the pulp half a pound of creamed butter, mix well, then add gradually five cups sugar, alternately with five whole eggs. Beat smooth, add the juice of three lemons, a tablespoonful lemon essence, and a scant pint of very rich milk. Use less milk if the potatoes are very soft. Beat smooth and pour into pie pans lined with good crust. Bake brown in a quick oven, but do not over bake. Lest the proportion of sugar may seem excessive, let it be said here that sweet potatoes require more sugar for sweetening than anything save crabapples or green gooseberries. Line a deep pie pan with short crust rolled a quarter-inch thick, fill it with raw sweet potatoes, peeled and sliced thin. Add to them, for a pan of medium size, three cups sugar, a cup of butter, cut in bits, mace, cloves and nutmeg to taste, half a cup of cold water and half a cup good whiskey or sherry. Cover with a crust an eighth-inch thick, prick well, also cut a tiny cross in the middle, and bake in a hot, but not scorching oven, three-quarters of an hour — a full hour if the pan is large. Turning another pan, fitting the rim over, helps to make the baking sure and even. Remove the cover pan ten minutes before taking up. Serve hot. This requires no sauce. One pound of steamed sweet potatoes finely mashed, two cups sugar, one cup cream, one-half cup butter, three well-beaten eggs. Flavor with lemon or nutmeg and bake in pastry shell. Fine. 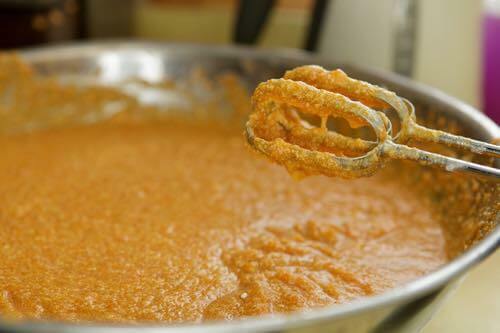 Boil or bake sufficient sweet potatoes to make a pint of the pulp when rubbed through a colander. Add one pint of milk, small cup sugar, pinch of salt, yolks of two eggs, one teaspoon vanilla extract. Bake in shallow pan lined with rich pie crust. When done beat the whites of the eggs with two tablespoons powdered sugar. Spread over top of the pie. Brown slightly in the oven. When you gather your sweet potatoes for the sweet potato pie recipe, set one aside to make a living table decoration. "Table decoration is my hobby," says a writer in the Christian Science Monitor. "I have tried all kinds of roots and seeds in a dish of stones and water and find that some are very much prettier than others. One of the most attractive centerpieces is a growing horseradish root. Split the roots so the rootlets can run out in a low dish, filled with small stones and water. "No care is required except to maintain fresh water covering only about half the roots and the picking of wilted leaves. These roots will last three or four months before decay. "Carrot tops make an artistic fernery. I have mixed carrots and horseradish roots, making a fancy table decoration. "Not long ago, I placed two small sweet potatoes in a plain, deep pottery dish and behold! In a few weeks I had a beautiful, trailing vine that was admired by all who looked at the glossy green leaves."